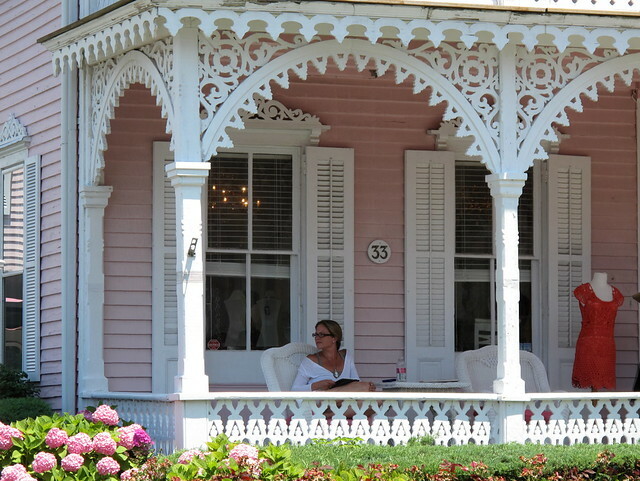 Back to Cape May, N.J…. As I mentioned, many of the old Victorians were harder to see because of all the overhanging branches. This is one of the few with unobstructed views. It’s in such great shape too. 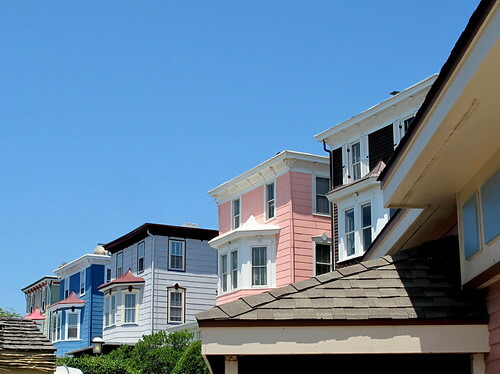 I can’t get over the colors of Cape May…. 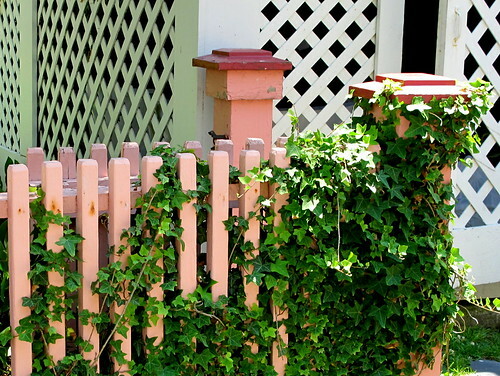 with a fence to match. 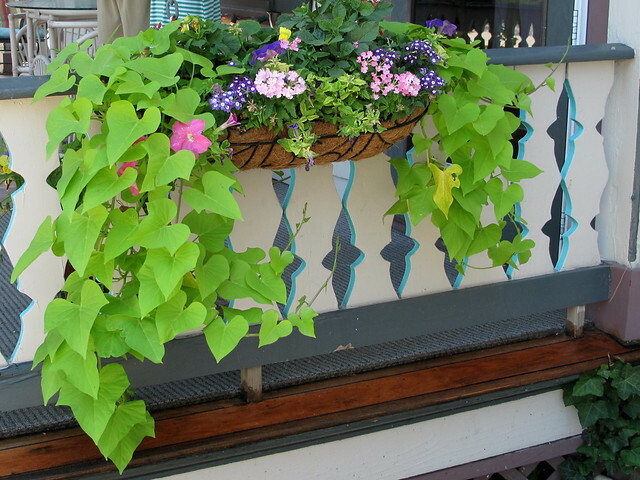 flowerboxes and ornate wooden railings. 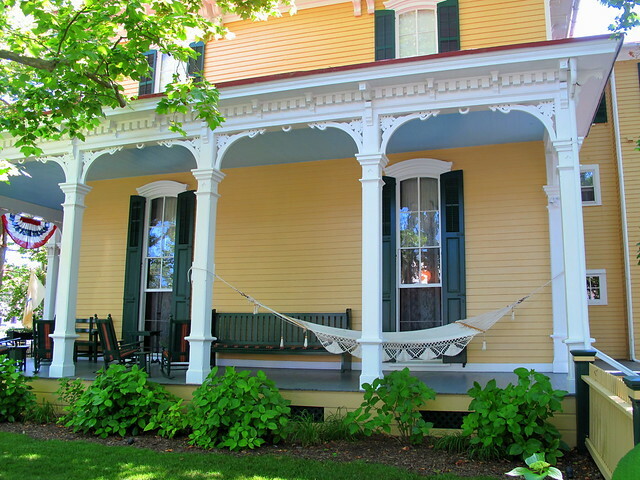 How nice would it be to hit this hammock after a long day of sightseeing? and a white-gingerbread porch made for reading. 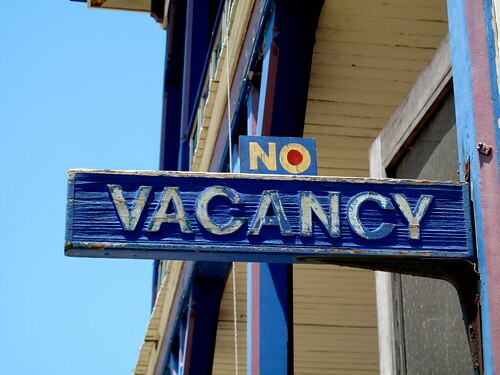 We saw a lot of signs like this when we were in Cape May…. 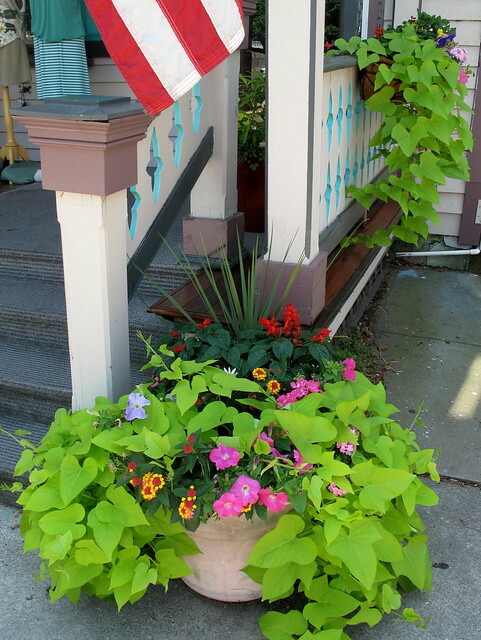 This entry was posted in photography and tagged Cape May, coral fence, coral house, flowerboxes, gingerbread, hammock, New Jersey, no vacancy sign, painted ladies, pink Victorian, potted flowers, Victorian-era architecture. Bookmark the permalink. Beautiful homes and gorgeous colors as usual!! Thanks so much, Mindy. I see you’ve changed your avatar…does this mean you’re done blogging on WP? I also see that you’ve retweeted this–thank you! What an amazing place. And the detail!!!! . . . beautifully captured. 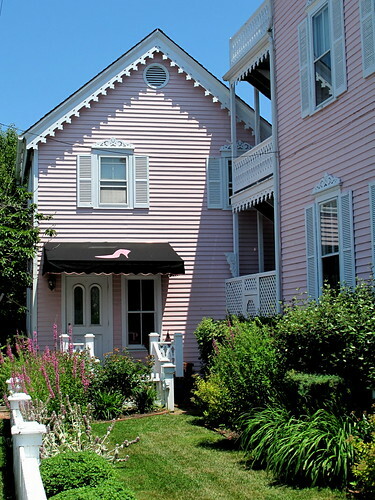 This Cape May series belongs unquestionably with Pearls-and-Prose’s Greatest Hits. Thanks for the treats . . . So lovely. The houses and the flowers are wonderful. I would love to stay and maybe live there! Thank you, and welcome to the blog! Cape May really is a wonderful place. One is more gorgeous than the other. I also like them when they are covered by branches, makes them so mysterious but I don’t mind a good view at all those sophisticated details. We were also happy to have the shade. It was pretty hot and sunny that day. Love the beautiful photos and especially the one with all the white gingerbread on the front porch. I agree it would be perfect for reading. Thanks, Jeanne. Hope you are doing well. 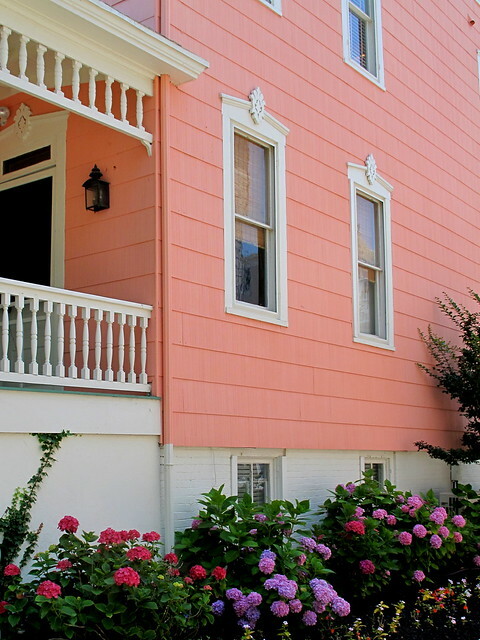 The colours are all dazzling, but coral is the winner in my books! 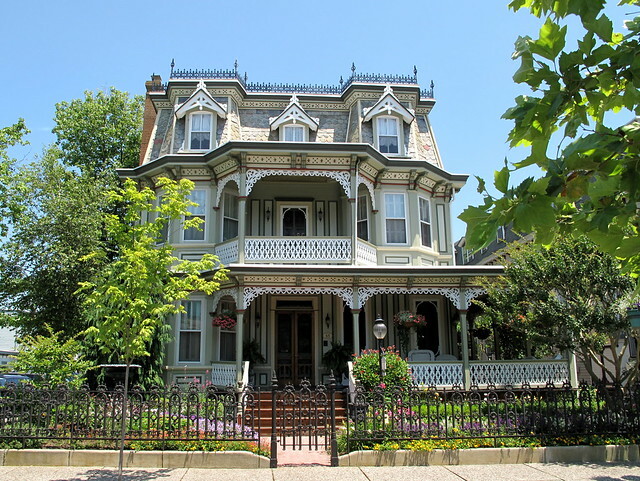 Gingerbread is popular in some of the rural regions of Southwestern Ontario, but I’ve never seen anything as complex and ornate – or in such pristine shape – as Cape May! Beautiful pics, Carole. Hey, Cheryl! Was just wondering how you were. I love the coral too. 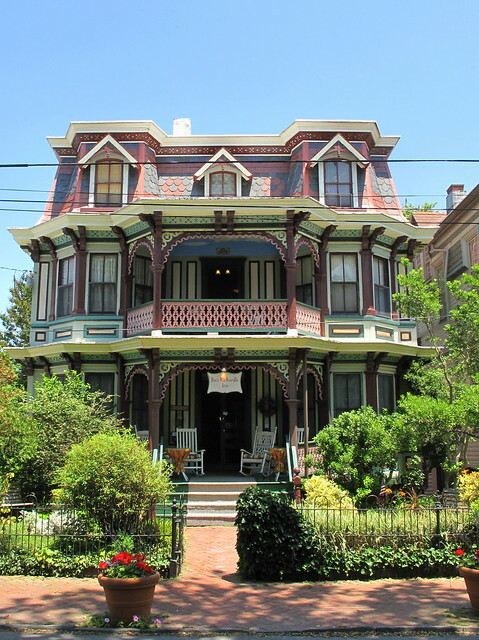 Cape May actually has the most Victorians in the U.S. after San Francisco.